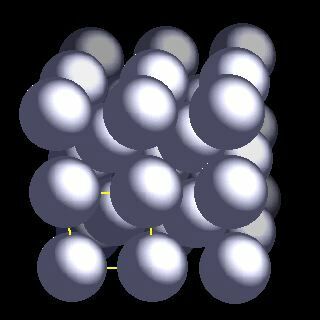 Lithium atoms have 3 electrons and the shell structure is 2.1. The ground state electronic configuration of neutral lithium is [He].2s1 and the term symbol of lithium is 2S1/2. Lithium: description Your user agent does not support the HTML5 Audio element. Lithium does not occur as the free metal in nature because of its high reactivity. Deposits are known all aroun the world. It is a minor component of nearly all igneous rocks and is a component of many natural brines. The solid state structure of lithium is: bcc (body-centred cubic). Reactions of lithium as the element with air, water, halogens, acids, and bases where known. Binary compounds with halogens (known as halides), oxygen (known as oxides), hydrogen (known as hydrides), and other compounds of lithium where known. Bond strengths; lattice energies of lithium halides, hydrides, oxides (where known); and reduction potentials where known. Lithium was discovered by Johan August Arfvedson in 1817 at Stockholm, Sweden. Origin of name: from the Greek word "lithos" meaning "stone", apparently because it was discovered from a mineral source whereas the other two common Group 1 elements, sodium and potassium, were discovered from plant sources.. 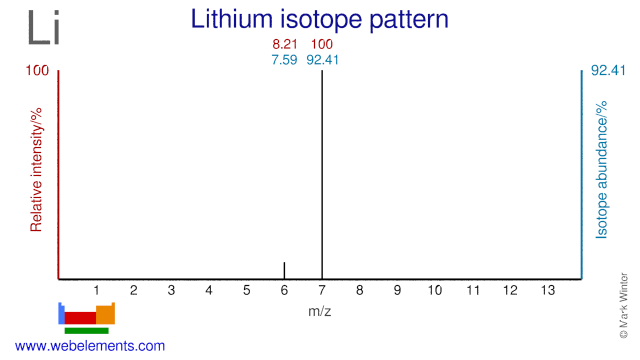 Isotope abundances of lithium with the most intense signal set to 100%. Isolation: lithium would not normally be made in the laboratory as it is so readily available commercially. All syntheses require an electrolytic step as it is so difficult to add an electron to the poorly electronegative lithium ion Li+. The ore spodumene, LiAl(SiO3)2, is the most important commercial ore containing lithium. The α form is first converted into the softer β form by heating to around 1100°C. This is mixed carefully with hot sulphuric acid and extracted into water to form lithium sulphate, Li2SO4, solution. The sulphate is washed with sodium carbonate, Na2CO3, to form a precipitate of the relatively insoluble lithium carbonate, Li2CO3. Reaction of lithium carbonate with HCl then provides lithium chloride, LiCl. Lithium chloride has a high melting point (> 600°C) meaning that it sould be expensive to melt it in order to carry out the electrolysis. However a mixture of LiCl (55%) and KCl (45%) melts at about 430°C and so much less energy and so expense is required for the electrolysis.